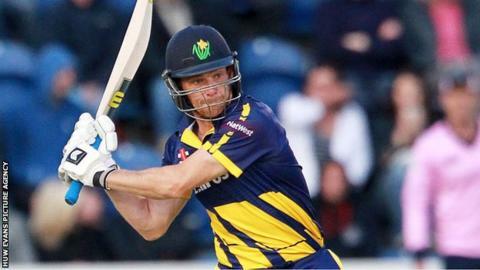 Glamorgan all-rounder Graham Wagg hopes to fit for the county's One Day Cup match against Essex. Wagg was ruled out of the game against Kent after suffering a "mild concussion" in the T20 Blast defeat against Gloucestershire. The 32-year-old said he was "shaken down to my boots" by a Craig Mills delivery, but was recovering well. "Everything is showing up fine and hopefully I'll be fit for Friday," Wagg told BBC Radio Wales. Wagg has been undergoing concussion protocols and being assessed by, and said that it was the first time he had been hit hard while batting. "I was shaken down to my boots, and it's the first time it I've felt that," added Wagg. "Luckily there was a doctor in the ground and he came up and did some tests and it was a mild concussion. "The following evening wasn't too pleasant either. I had a banging headache and a sore jaw, but I just want to crack on now this week and get fit for Friday." The issue of head injuries has been thrust into the limelight following the death of Australian batsman Phillip Hughes in November 2014 after being hit while playing for South Australia against New South Wales. Player safety has also been hotly debated in professional rugby union after Wales wing George North suffered a series of concussions in the 2014/15 season, leading to a prolonged absence from the sport. Wagg had played in every first-team game for Glamorgan in 2015 before the abandoned match against Nottinghamshire, where he was replaced by Ruaidhri Smith.